Strictly FYI & FWIW, a fellow at "Hifihaven" just got a Saga to play with. MacBook Pro running Roon-Monoprice USB-Schiit Gungir Multibit-Audioquest Earth-Schiit Freya with Tung Sol 6SN7s-Audioquest Sky-Krell FPB 400cx-Audioquest Mont Blanc-1.2tls with all the mods. Nice, thanks for the heads up, enjoyed reading about his initial impressions. Anxious to get mine back in the mix! I've been enjoying my Schiit Saga for more than a year now. The stock Russian tube was decent, but swapping in a nice old Sylvania 6SN7GTA did improve the soundstage. Poor Quicksilver someone actually did turn it up and ripped the knobs off like they would say on the radio! 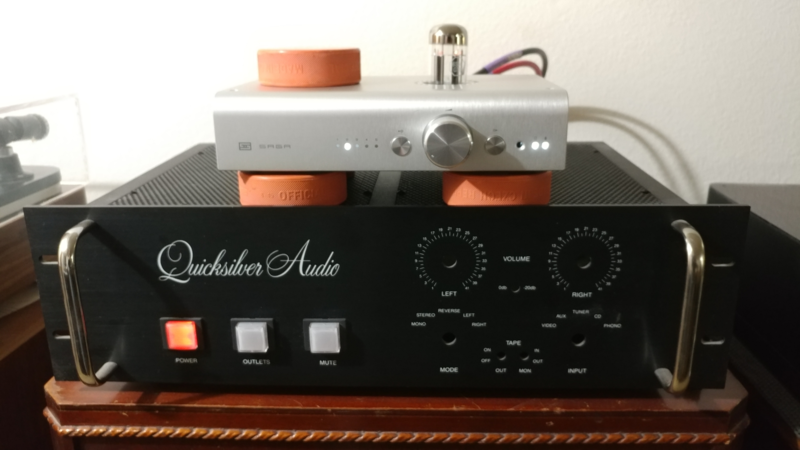 I think the poster in the Hifihaven thread used the husk of a Quicksilver something-or-other to house a DIY phono preamp. In the Hifihaven thread, the Saga is described as a "passive pre with a tube buffer". Am I correct in assuming they are implying that it has a subtle and less "tubey influence" than the way that tubes are implemented in other types of preamp designs? The Freya for example, with one 6sn7 per channel on both the input gain and output stages? Just gotta say... the name Schiit must be driving the Ken twins nuts. Yes, in principle, a tube buffer (e.g., a cathode follower) will have zero audible impact on sound -- except -- in that it will (should) improve performance if there is an impedance mismatch between source and load. The buffer will (should) also improve the source's ability to drive the load, especially if the cables between source and load are long. IN either of those latter cases (impedance matching or drive enhancement), of course, there should be (could be) audible improvement. It would be really interesting to know the operating points of the 6SN7 in the Saga (particularly the plate voltage) -- my guess is that the Schiit boys behaved themselves, implemented a "proper" buffer and reap the benefits thereof. I am not curious enough to buy one just to measure the voltages and find out myself, though! I might still buy one to use it, though... no plans yet (for now, I'm happy to live vicariously & speculate liberally). Mr. H dropping knowledge bombs, per usual! Thank you for the informative post. I don't think they divulge what the plate voltage is, but they do mention "regulated +/-100V rails, plus 6.3VAC heaters", "Hybrid push-pull tube-BJT buffer stage with equalized transconductance", and "hybrid tube buffer—a serious buffer running on 200V rails with vanishingly low distortion." If I ever come across a second preamp, I will send you the Saga to play with for a few months. The "real voltages" they mention is their way of saying that the tube is really doin' something in the circuit -- which is good. I must've read their ad copy at some point (but forgot)! Coming up on the 3year anniversary....lmao!!! Its like a mini Russ scenario.... gear stashed all over in case of a disaster in his area, he just calls in the backup gear lol..
Yeah, but Russ pays for his. @mrbiron, you know you oughta make the trek up sometime and you could actually see and hear your Reduction and it could then go home again. Think of how much better we'd all feel! Or, I could just pack it up & mail it back -- with an extra set of tubes for it as a meager kind of demurrage. Speaking of Russ -- he has an amp here, too -- and he needs to wander by sometime -- too. Tell you what -- c'mon up this summer and help me go through some of them. RE: what does the Saga do? It has 5 inputs and 2 outputs. It is a relay switched attenuator. It has a remote control. It has two modes of operation: 1) passive; 2) tube buffer which may be necessary if you have a low input impedance amp or if you need to drive long ICs. The tube buffer does not significantly color the sound (to my ears), but I think I hear a slight improvement in sound stage (when using the old Sylvania tube, but not with the stock Russian tube). Any comments on its sound quality or sound signature versus other preamps that you've used in the past? To my ears, the sound quality of the Saga is excellent: transparent and uncolored. The tube buffer mode does NOT make for a 'tubey' sound, if that is what you are looking for, at least not as far as I can tell. As always: YMMV. We all hear things differently. One advantage of the resistor style attenuator is that even at low volume, there are no channel level problems which sometimes occur with variable potentiometers. I did not feel the need of moving up to the Freya, as I have no use for balanced connections, nor do I need the gain stage mode. Thanks Jim for your feedback. I've only used my Saga in passive mode, haven't installed a tube yet! That'll be coming soon. I really like how the relay stepped attenuator was balanced at lower volumes, as I've had issues with traditional volume pots being imbalanced before. Also it's interesting that even when the volume knob is turned all the way down, music still is heard. I've only put 10 hours or less on mine, but I would echo what you are describing regarding it's sound signature, it seems to not impart any sonic signature or colorization onto the sound. To my ears, it sounds neutral. On the Freya, you have 3 different modes you can run in. Running balanced anyway, the levels differ enough to make comparisons require significant level adjustment. So mode changes, while interesting, wind up being a bit painful when in a play around mode. Haven't actually played with the Freya much, as it wasn't able to unseat an Atma Sphere pre and had pulled it for going to a group get together. Need to get it back in rotation again. I've heard the same regarding the Freya, that the stock tubes are pretty much garbage and should be discarded sooner rather than later. What tubes did you go with to replace them? I flipped back and forth between passive and tube mode and I could not hear any discernible difference between the modes. Perhaps it's because the tube is not yet broken in? Not sure. THe 6H8C that came w/ my Saga was supposed to be a NOS Russian tube, so what you list may not be significantly different. The stock tube sounded fine to me, but as you say, there wasn't any significant difference between passive & buffered mode when feeding into my ST-35. The ACAs, however, did better in buffer mode due to impedance input of the ACA. Changing to the Sylvania 6SN7-GTA did result in a small improvement in sound stage--or at least I THINK it did; can't rule out placebo effect. I think the effects of tube rolling in a buffer are much less than you would see than in the Freya where the tubes are used for active amplification. Nailed it. I think this is spot on. Even in the YouTube demos I watched of tube rolling in the Freya, it was very subtle (yet noticeable) there. Next up to try is @mhardy6647's Sylvania that he sent me. Also, I noticed something unusual/different from when I was using it previously without a tube installed. I put my ear close to the speaker and adjusted the volume with nothing playing, and I could actually hear the relay clicks and electrical noises coming through the speaker. Not sure if this is because of the tube picking up the noises and transferring them out, or because my Saga is now right next to my power amps and it wasn't previously. I'll try running it without a tube again and see if the relay clicks can still be heard through the speakers. Either way, it's not a real "issue", just something I noticed. I think the effects of tube rolling in a buffer are much less than you would see than in the Freya where the tubes are used for active amplification. I'm eager to hear your impressions of the Sylvania tube vs. the Russian. Haven't forgotten about this, just haven't been able to log a ton of hours on the system. I wanted to get until about 10 hours on the Russian tube so I would have a general idea of it's sound, before switching to the Sylvania that @mhardy6647 gave me. Should hit that this week so swapping tubes should happen soon! Although it's supposed to be raining all week, so you know that extra white noise of the rain hitting the roof is not good for a "low noise floor"! ... just be glad you don't have a northern New England style "standing seam" (metal) roof! You wanna talk about white noise when it rains. @mhardy6647's chrome top Sylvania has officially been swapped in. After letting it get up to temp and toggling between passive and tube mode, I can hear an ever so slight shifting outward of the horizontal soundstage with it engaged. It's super subtle, but there is also a slight increase in the richness or fullness of the sound. Again, minuscule changes, just barley detectable. Maybe there's a specific genre of music where it would be more noticeable than others. I'll try some jazz SACDs here shortly. Tried it out with the jazz SACD and then back to downbeat/chillout music. Tried switching it back and forth a few more times and now I don't hear any difference between passive/tube mode at all. Whatever the tube is adding must be super subtle. Perhaps a better way to use this thing is just to insert a nice 6SN7 tube, leave it in tube mode, and just enjoy the sound. I guess it's just not a very "tubey" preamp! To me it sounds super accurate and musically engaging, with a "flat" presentation that doesn't accentuate any frequencies. Very clear and coherent sound. Those results suggest that the active circuit in the Saga is in fact operating as a buffer, which is impressive, actually. If so, there are certainly cases in which it could improve performance, but only if there were a substantial impedance mismatch between source and load. The ol' rule of thumb (which is no more, nor less, than just that). Input impedance of the load should be at least ten times the output impedance of the source.